* AVIATION: Air India is seeking 21 bln rupees from the government to address its immediate operational needs. * AUTOMOBILE: In an effort to incentivise electric vehicle buyers through cross subsidies, the government is considering a proposal to impose a marginally higher tax on conventional petrol and diesel cars. * BANKING: Senior officials from the Ministry of Finance have informed the Standing Committee of Parliament on Estimates that the ministry is working to reduce bad debts in the banking system, a member of the panel said. 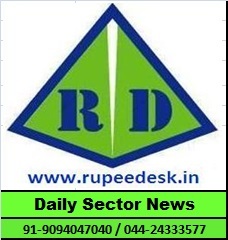 -The Reserve Bank of India will continue with three-day meetings for its monetary policy deliberations, as adopted for the June policy. -The government expects to detail rules on personal guarantors to insolvent companies in a month. -The Allahabad High Court granted more time to the government to present its views in a case related to the application of Reserve Bank of India's new norms on stressed loans in the power sector. -Banks plan to ask the Securities and Exchange Board of India to allow alternative investment funds to own more than 51% in listed securities. * CORPORATE: SBI Capital Markets and The Export-Import Bank of Korea have signed a memorandum of understanding with an aim to establish up to $1.5 bln line of credit from Korean agency to Indian lenders. * EXCHANGES: The National Stock Exchange and MULTI COMMODITY EXCHANGE OF INDIA have held exploratory talks to combine their operations and provide a one-stop shop for trading in all kinds of products. * FERTILISERS: The Department of Fertilizers released 167.95 bln rupees in subsidy in Apr-Jun under the direct benefit transfer scheme, 22.9% of the total fertiliser subsidy budgeted for 2018-19 (Apr-Mar). INDUSTRIES, Del Monte, MARICO, Kellogg's, Heinz, Patanjali and others have pledged to reduce the salt, sugar and transfat content in their products as part of an initiative called the Eat Right Movement. * MUTUAL FUNDS: SEBI has launched adjudication proceedings against the fund house to further probe misuse of investors' money. * OIL AND GAS: The Petroleum and Natural Gas Regulatory Board has received over 400 technical bids for 86 geographical areas that will go under the hammer in the ninth round of city gas distribution auction. * POWER: Power Secretary Ajay Kumar Bhalla said the Centre had received bids for power purchase pacts for around 1,900 MW, in an auction to help generation companies sign agreements with state distribution companies. * STEEL: ArcelorMittal has said it was eligible under the Insolvency & Bankruptcy Code to bid for Essar Steel as it was not a promotor of Uttam Galva and KKS Petron, and had already offloaded its shares before submission of the bids. * TELECOMMUNICATION: Preliminary investigations by the Enforcement Directorate indicates the involvement of former finance minister P. Chidambaram in the alleged irregularities in Foreign Investment Promotion Board's approval for the Aircel-Maxis deal, the investigating agency informed a lower court in Delhi.